The second edition of a bestselling textbook, Using R for Introductory Statistics guides students through the basics of R, helping them overcome the sometimes steep learning curve. The author does this by breaking the material down into small, task-oriented steps. The second edition maintains the features that made the first edition so popular, while updating data, examples, and changes to R in line with the current version. Increased emphasis on more idiomatic R provides a grounding in the functionality of base R.
Discussions of the use of RStudio helps new R users avoid as many pitfalls as possible. Use of knitr package makes code easier to read and therefore easier to reason about. Additional information on computer-intensive approaches motivates the traditional approach. Updated examples and data make the information current and topical. The book has an accompanying package, UsingR, available from CRAN, R’s repository of user-contributed packages. The package contains the data sets mentioned in the text (data(package="UsingR")), answers to selected problems (answers()), a few demonstrations (demo()), the errata (errata()), and sample code from the text. The topics of this text line up closely with traditional teaching progression; however, the book also highlights computer-intensive approaches to motivate the more traditional approach. The authors emphasize realistic data and examples and rely on visualization techniques to gather insight. They introduce statistics and R seamlessly, giving students the tools they need to use R and the information they need to navigate the sometimes complex world of statistical computing. "Overall, I really like the rich examples and data sets that the book provides (through using the R package). I believe this is the strength of the book and I think many educators, especially those teaching first year statistics, would find this aspect highly beneficial to their students...the book is ideal for a trained statistician who has never used R."
"Now in its second edition, the book introduces the reader to exploratory data analysis and manipulation, statistical inference, and statistical models. Particular attention is given to thoroughly learning base R before extending R’s capabilities with packages. … interesting, topical, and challenging examples. … a stimulating read for the classroom-based student …"
"The author has made a very serious effort to introduce entry-level students of statistics to the open-source software package R. One mistake most authors of similar texts make is to assume some basic level of familiarity, either with the subject to be taught, or the tool (the software package) to be used in teaching the subject. This book does not fall into either trap. … the examples and exercises are well-chosen …"
"The book presents each new concept in a gentle manner. Numerous examples serve to illustrate both the R commands and the general statistical concepts. … Every chapter contains sample code for plotting … The book also has a rich supply of homework problems that are straightforward and data-focused … I found the book enjoyable to read. Even as an experienced user of R, I learned a few things. … Without hesitation I would use it for an introductory statistics course or an introduction to R for a general audience. Indeed, Verzani’s book may prove a useful travel guide through the sometimes exasperating territory of statistical computing." 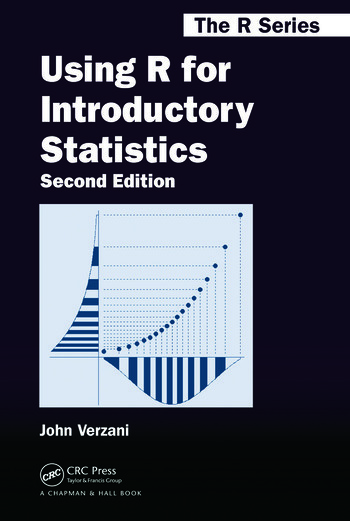 "This book sets out to kill two birds with one stone—introducing R and statistics at the same time. The author accomplishes his twin goals by presenting an easy-to-follow narrative mixed with R codes, formulae, and graphs … [He] clearly has a great command of R, and uses its strength and versatility to achieve statistical goals that cannot be easily reached otherwise … this book contains a cornucopia of information for beginners in statistics who want to learn a computer language that is positioned to take the statistics world by storm." "Anyone who has struggled to produce his or her own notes to help students use R will appreciate this thorough, careful and complete guide aimed at beginning students." "This is an ideal text for integrating the study of statistics with a powerful computation tool."